Durability, easy care and fresh good looks. 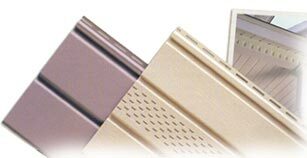 Enhance the appearance and performance of your home with Vytec Vinyl Soffit. - Easy-care vinyl never needs painting because it won't rot, peel or flake like wood. - Vented soffit circulates air and can help improve a home's energy efficiency. - Solid soffit adds an attractive finishing touch when ventilation isn't needed. - A selection of sizes and finishes gives you design flexibility.